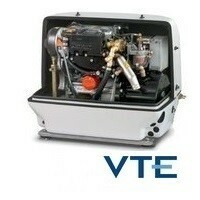 VTE Paguro Marine Generators	There are 9 products. Volpi Tecno Energia (VTE) has been manufacturing marine generators since the 80’s, with all of VTE’s design & manufacturing taking place in its state-of-the-art facility in Trieste, Italy. Working closely with major shipyards and distributors throughout the world, VTE’s policy of continuous development has resulted in the compact and powerful Paguro range of marine generators, known for their intelligent design, proven reliability & quiet operation. Paguro gen sets are powered by either Yanmar or Lombardini (Kohler) engine, include sound shield and remote panel, and come with a 2 year warranty. 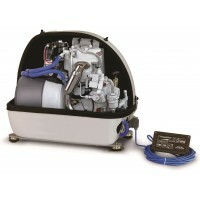 VTE PAGURO 5000 - 4 KW - 3600 RPM, 60 Hz Marine Generator. Yanmar Engine, 1 Cylinder. The perfect balance of high power, small size and quiet operation. Each Paguro generator is built with premium quality materials by qualified and trained technicians. All parts in contact with raw water are made in Stainless Steel AISI 316 L. Standard VTE warranty is 2 years from the date of end user purchase. 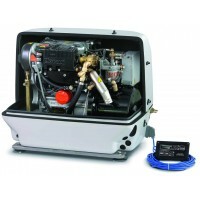 "Model Discontinued"
VTE PAGURO 6000 - 5.5 KW, 60 Hz Marine Generator. Lombardini Engine, 2 Cyl. The perfect balance of high power, small size & quiet operation. Each Paguro generator is built with premium quality materials by qualified and trained technicians. All parts in contact with raw water are made in Stainless Steel AISI 316 L. Standard VTE warranty is 2 years from the date of purchase. 50 Hz available. VTE PAGURO 9000 - 8.5 KW, 60 Hz Marine Generator. Lombardini Engine, 2 Cyl. The perfect balance of high power, small size & quiet operation. Each Paguro generator is built with premium quality materials by qualified and trained technicians. All parts in contact with raw water are made in Stainless Steel AISI 316 L. Standard VTE warranty is 2 years from the date of purchase. 50 Hz available. VTE PAGURO 14000 - 14 KW, 60 Hz Marine Generator. Lombardini Engine, 2 Cyl. The perfect balance of high power, small size & quiet operation. Each Paguro generator is built with premium quality materials by qualified and trained technicians. All parts in contact with raw water are made in Stainless Steel AISI 316 L. Standard VTE warranty is 2 years from the date of purchase. 50 Hz available. VTE PAGURO 18000 - 18 KW, 60 Hz Marine Generator. Lombardini Engine, 2 Cyl. The perfect balance of high power, small size & quiet operation. Each Paguro generator is built with premium quality materials by qualified and trained technicians. All parts in contact with raw water are made in Stainless Steel AISI 316 L. Standard VTE warranty is 2 years from the date of purchase. 50 Hz available. VTE PAGURO 6500 - 7.5 KW, 60 Hz Marine Generator. Lombardini Engine, 2 Cyl. The perfect balance of high power, small size & quiet operation. Each Paguro generator is built with premium quality materials by qualified and trained technicians. All parts in contact with raw water are made in Stainless Steel AISI 316 L. Standard VTE warranty is 2 years from the date of purchase. 50 Hz available. VTE PAGURO 8500 - 9.5 KW, 60 Hz Marine Generator. Lombardini Engine, 2 Cyl. The perfect balance of high power, small size & quiet operation. Each Paguro generator is built with premium quality materials by qualified and trained technicians. All parts in contact with raw water are made in Stainless Steel AISI 316 L. Standard VTE warranty is 2 years from the date of purchase. 50 Hz available. VTE PAGURO 12500 - 12 KW, 60 Hz Marine Generator. Yanmar Engine, 3 Cyl. The perfect balance of high power, small size & quiet operation. Each Paguro generator is built with premium quality materials by qualified and trained technicians. All parts in contact with raw water are made in Stainless Steel AISI 316 L. Standard VTE warranty is 2 years from the date of purchase. 50 Hz available.